Today is our first day of our "Week In Torquay". Shane and are spending the week camping with two other couples - Mick & Lois and John & Robyn. I'm sure I will have a chance to show you a photo of them at some stage during our time here. As you can see the new tent is up with only a little bit of tension between Shane and I. Considering this is only our first use of this tent (2 practice sessions previously) a little bit of tension is pretty good. We were going to bring a tent that we have had for years, it actually belonged to my Mum & Dad. But after having it up in the back yard for a few days of lots of rain and some of that rain ending up on the inside of the tent we decided we had to seek alternative accommodation. Thanks goodness my friend Jenny used to own a store called Paddy Pallins and they specialised in all outdoor equipment and she had some left over stock. I really enjoy camping, it is so nice sitting outdoors even if it's not so warm. So I am now of to go an sit with friends and have a quiet drink. Fabulous tent, Davine! I trust it is keeping you dry from the rain and you are enJOYing your outdoor time. 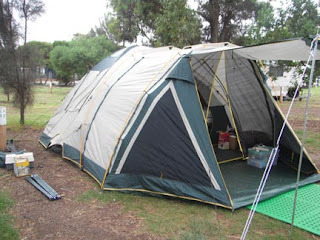 I love the way your tent looks especially the front part! Have fun! This is awesome! What an amazing way to spend some quality time together, good for you. Enjoy all that fresh air! Now, I sleep in my car... in France, Spain and Switzerland I mean. The car is big enought as I need to carry my windows decorations staff.